Familiar yet otherworldly, Olav Nielsen’s meticulously worked images embrace memories and dream. They are distinctively of New Zealand, but at the same time have an edge, a feeling of a not-quite-familiar place, just as a dream is true and not true at the same time. In the decade after graduating from Otago Polytechnic, this Danish-born, Dunedin-based printmaker quickly reaped accolades for his mastery of the meticulous craft of aquatint and mezzotint, in the exquisite play of glowing light and shadow in his work. Extraordinary is an understatement in describing his printmaking, often in large works of intense colour that stretch the very limits of the craft. Olav Nielsen’s print-and-plate works defy the capacity of printmaking to produce multiple numbers of a single composition. Instead, he makes a single print from the etching, and sets it alongside the original plate itself. The composition is often a half-image, only completed once the plate is mounted adjacent to the print to create a mirror image in two media, one on paper and one in metal. The finely worked etching plate – often zinc – is exquisite in its own right yet seldom seen, and Nielsen brings it out of the studio into the public gaze, exposing the beauty of process. For the viewer, there’s a small shock that the plate, once framed with the print, can never be used to make a further print. Olav Nielsen frequently uses colonial architecture – especially the New Zealand villa – and southern landscape as frameworks for an exploration of the psyche, tapping into his dreams, and allowing the viewer to connect with their own memories, journeys and sense of self. Light gleams through stained glass windows or streams into bare hallways; small details or a lone dog cast long shadows, a suggestion of history filtering into the present. The untamed landscape and sparse native plants sweep hard up against the cultivated gardens and pathways of the villas, suggesting a place of retreat or oasis, yet his worlds are unpopulated other than by the lone dog, or a heron. Shoes, or washing on the line, suggest recent human occupation. For further information about the artist or his technique please contact exhibition director Barbara Speedy. Not all images may be shown on the website, please enquire for new works. Danish-born, Olav Nielsen emigrated to New Zealand aged 12 in 1990, and there is a palpable essence of both Europe and New Zealand in his work. That unique vision, and especially his outstanding craftsmanship as a hands-on printmaker, has established a strong reputation. His mezzotints and aquatints are in demand with collectors here and overseas, and he is regarded as a young talent to watch for the future. Much of his work arises from culture shock: a young boy adjusting to the shift from Denmark to New Zealand, trying to determine his true identity. The hallways of the villas are transitional spaces, with doors leading into rooms like the compartments of identity and memory, their contents not quite known but suggested, streaming through a window, glimpsed through a doorway, suggested behind a billowing curtain. Pathways and hedges barely fence out the wildness of the untamed New Zealand landscape, powerful sweeping shifts in weather, the villa and its garden an oasis of civilisation. Long shadows cast the past into the present and imply the future; colours are seductive yet edgy. 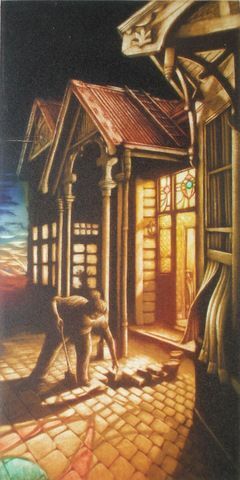 Light glows from within the work in what has already become Nielsen’s signature, a technique in printmaking he has evolved since his time as a student at the renowned printmaking school of Otago Polytechnic. He graduated Bachelor of Fine Arts in 2000 and in 2007 was Printer in Residence under the programme run by Special Collections, University of Otago Library, illustrating poems by the late Hone Tuwhare. He has exhibited throughout New Zealand, and his work is held in public collections and private collections here and overseas.